When my dad’s memory loss first became apparent, we thought it nothing more than a symptom of age. But as symptoms progressed and his confusion worsened, we sought advice from his doctor. A diagnosis of Alzheimer’s explained a lot of the confusing and irrational behavior we were beginning to see, and we soon discovered that dad was more than my mom could handle safely on her own. You see, in addition to memory loss and disorientation, dad was also becoming increasingly agitated and restless. We learned that BrightStar Care offered home care in St. Louis, and we made the call. Dad’s caregiver explained that he was probably feeling anxious and frustrated by his inability to remember. He couldn’t remember how to hold his utensils, couldn’t remember where he was. He often tried to leave the house, saying he needed to “get to work” or “go home”. The caregiver helped my mom understand that nothing he said or did should be taken personally; mom used to argue with him, but soon learned that dad really didn’t understand what he was saying and doing. Try to pinpoint and address what's causing him to be agitated. Is he hungry, tired or does he need to use the bathroom? Keep loud, abrupt noises and bright lights to a minimum, especially at night. Hang jingle bells on the front and back doors to alert us if he tries to leave. Be sure to keep the doors locked. Tell the neighbors to let us know if they see dad in the yard or on the sidewalk. While I live across town, Mom was relieved that she was no longer alone in providing care. Partnering with BrightStar Care Central St. Louis helped her relax and care for her own needs. Dad's caregiver established daily comforting routines, including personal care, meals and light exercise. Alzheimer's disease and dementia present challenging complexities that are constantly changing. It's perfectly acceptable to get assistance for your loved one's needs -- and to get coping strategies for his safety and your peace of mind. Do as my family did. Rely on BrightStar Care for your home health care in St. Louis. 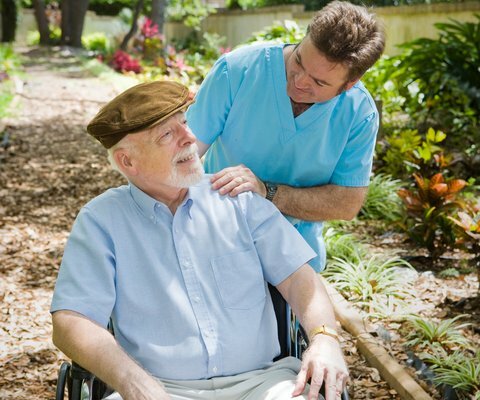 Learn more about Alzheimer’s home care in St. Louis. Call BrightStar Care at (314) 984-8650.